Amber Fox is an insurance investigator, working for Brad Beckett. Who was once her ex-fiancé. Who is now her boss. And her fiancé. Confusing? Yes, but the back-story is explained enough that you understand what’s going on, and leaves enough out that you really want to go back and read those two other books. When the daughter of a wealthy businessman disappears, and Amber realizes that her best friend disappeared no more than six months before, she finds herself in the middle of a fast-paced mystery. And she uncovers the fact that the businessman’s wife (an esteemed voodoo priestess from Haiti) has a sister who practices left-handed--or black--voodoo, things take a turn for the creepy. This novel was reminiscent of Janet Evanovich’s writing. Amber has a unique and distinct voice that reads easily and drew me in from the start. Her dad’s antics provide a fantastic comic foil to the potentially dark situations that Amber ends up in. It’s also evident throughout this novel that Ms Hodge has really researched her subject matter. So often voodoo is thought of simply as black magic, with people casting bones and making dolls with pins sticking out of them. 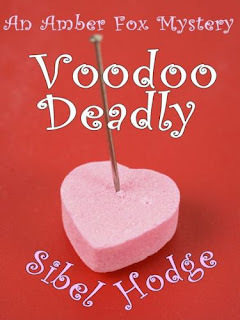 Ms Hodge has done enough research that she could present voodoo as it really is: a religion that believes in a higher power, with loa, or spirits being the intermediaries between the living world and Bondye, the creator. Her portrayal of voodoo as being a peaceful belief, centered in healing and helping others was a delight to read. As well, the facts and figures she could present throughout the book regarding some other issues brought up really lent gravitas to the situations. 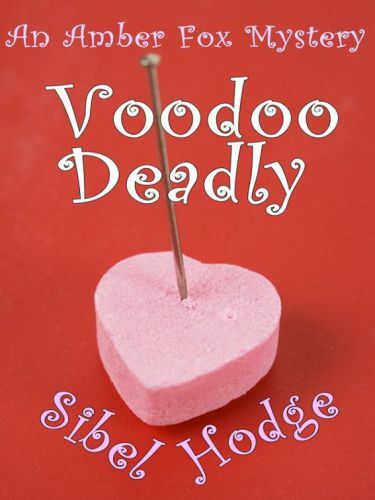 As a stand-alone novel, "Voodoo Deadly" really works. I have already bought the previous two books for my kindle, though, just because Ms Hodge drew me in so well that I can’t stand not knowing details of Amber Fox: where she came from, what really happened with her longstanding police career, and why she accepted the job to work for Brad when he was her ex-fiancé. I can’t wait to learn these little details, and maybe even more about some of the peripheral characters. Again, Ms. Hodge has built intriguing personas for more than just the protagonist, which is such a great way to hold interest throughout the novel. I really have no criticism for this book. It was light and fun: a fairly quick read, but it never felt silly or forced. It never dragged along, and I actually felt like I learned something from it. I’m really looking forward to seeing what the first two books in this series are like, and hopefully following Amber Fox’s adventures for a few more books. It feels like the series won’t take too much effort to maintain its tempo, and at a Kindle price of less than $4 for each novel, I can definitely afford the ride. uppoDis 61Great review. One of my fave authors. I highly recommend reading the first two books in the series as well. LOL. That's why I couldn't prove I wasn't a robot the first time!! What a nice review. Well deserved. Aw, thanks so much, Pj, that's so nice to hear!